Cables: Arkana Physical Research Loom, Audio Art SE and Classic cable looms, JPS Labs Ultraconductor 2 speaker cables, Madison Audio Lab E3 Extreme 1 Interconnects/Extreme 2 speaker cables, Signal Cable Silver Reference interconnects and speaker cables, digital optical and coax cable, Audio Sensibility Impact SE balanced interconnects, Statement S/PDIF and Impact USB digital cables, DH Lab Power Plus AC cable. Two versions, two prices. The reviewed version is on top. From the land of the mighty Parthenon surrounded by the azure-coloured sea comes a fresh pair of digital offerings by newcomer Ideon Audio. 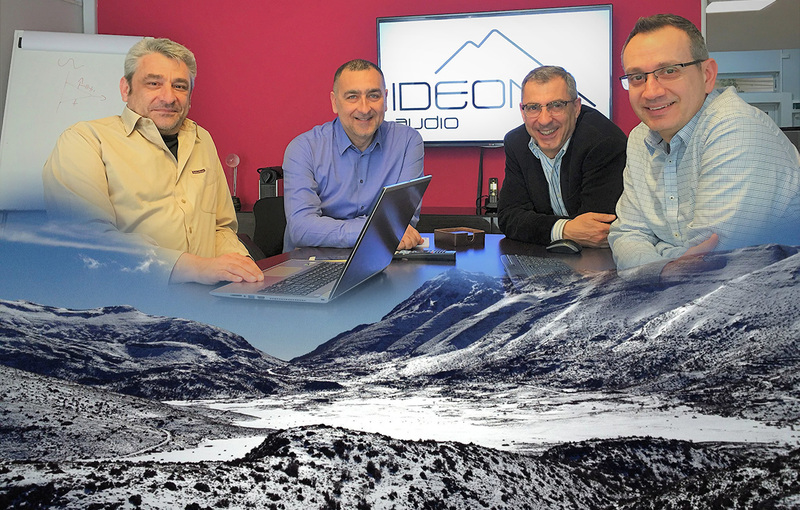 The name derives from Ideon Andron, an ancient cave at an altitude of 1498 meters on Mount Ida in central Crete said to be the birthplace of Zeus. That portends very lofty ambitions for these products and a tough name to live up to. The company is comprised of "a team of audiophiles and music lovers with professional engineering know-how" who aim to squeeze the musical magic from the encoded bits of the digital medium. Their DAC promises serious performance and their USB conditioner optimization of the USB pipe for audiophile results, both aimed at real world pricing. Named after "a cool intense breeze out of the clear sky", the Ayazi concentrates exclusively on D/A conversion and eschews bells and whistles. There's no volume control, headphone output, XLR out or remote control. Inputs are just two: 24/192 coax and 32/384 class 2 USB. DSD must be converted to 24/352.8 PCM in player software. The backbone of the design rests on the workhorse ESS ES9023 which lends its proprietary Hyperstream conversion and Time Domain Jitter Eliminator to the process. USB reception is via C-Media CM6631A, trusty S/PDIF is managed by the Wolfson WM8804 with good reputation for jitter suppression. As implemented in the Ayazi, the Wolfson won't support 176.4kHz via S/PDIF but since this sample rate is supported by USB, it shouldn't be an issue. Timing goes to a Crystek CCHD-957 clock. Construction is Spartan. The basic cabinet is 1mm folded grey sheet metal with a 4mm brushed aluminium face plate measuring 29x17x8cm WxDxH which weighs in at a surprisingly substantial 6.6 lbs. The fascia with company and model logos fastened with recessed Allen bolts adds two toggle controls, a simple on/off power switch on the left and an input selector on the right. Both have lights. The two-tone selector LED changes from pink to blue to confirm signal lock. The rear panel is comprised of a female B USB input, a quality gold-plated RCA input, a pair of equivalent analog outputs and a recessed 3-pole power input. Different face and body colors are available. There are four 10mm high rubber isolation feet on the bottom. Depending on region the DAC will come pre-configured for 100-120V/60Hz or 200-240V/50Hz. Ideon include a basic power cord and instruction manual. Vasilis Tounas (Chief Engineer) George Ligerakis (Chief Operations Officer), Greg Mitsacopoulos (Marketing Director) and Angelos Gallis (Sales Director). Crete's mountain below them. Running USB audio requires different procedures depending on operating system. iOS or Linux require no drivers. They recognize the device upon connection. For Win 7-10, a driver should download automatically with a standard 'follow the bouncing ball' setup sequence. Here Ideon suggest patience as the download may take time. In the event of older Windows versions or failure of the automatic install, the driver is available also on their website whilst the supplied user manual has a simple set of instructions to guide you through the process. A maximum 2m USB A-B cable (not supplied) is required with the stipulation of a 2.0 rating. USB 3.0 is not accepted. The companion 3R USB Renaissance is a lightweight pocket-sized intermediary between USB source and DAC. It means to compensate for and correct signal degradation from cable loss, poor power supplies and clocking errors. The 3R stands for redrive – reclock – regenerate. Ideon posit that USB is a flawed transmission protocol which requires TLC to bring home. Again, the 3R USB Renaissance uses a 3-prong approach. It acts as "signal booster"; reclocks the signal with ultra low-jitter oscillators; then regenerates the noisy 5V computer power with dedicated ultra low-noise regulators. This tiny device isn't about enhancements but rather, careful signal preservation. Its dimensions are 75x55x18mm WxDxH. Construction is a brushed aluminium clamshell finished with black plastic end caps. The input side has a 6-8V recessed jack for the supplied 7.5VDC global wall wart and a type B USB connector. The output end has a type A USB jack and two LED indicators, one which lights yellow when connected to the USB source, the other green when power is connected. Ideon state that best results are obtained with the 3R USB Renaissance at the DAC end of the USB cable. The 3R uses a high-speed controller compliant with USB 2.0 standards and your PC/Mac should recognize it immediately as a driverless USB hub. Over the course of the review, I had e-mail chats with Ideon's George Ligerakis to gain insights into the designs and the people involved. Q: I see that you are listed as a Greek company according to the address. How large is your band of audiophile entrepreneurs and are they local or scattered around the world? A: Thank you for asking about the people! There are four founding partners/shareholders: Vasilis Tounas, George Ligerakis and Novatron SA, a company represented by Angelos Gallis and Greg Mitsacopoulos. We all live in Athens at this time. All of us are music lovers and Vasilis, George and Greg are long-time audiophiles as well. Angelos patiently tolerates our listening/tuning sessions to get deeper into our collective audiophile madness. Vasilis is our tech guru and circuit design expert. Greg & George deal with company operations, communications, commercial issues and tuning and system compatibility. Angelos manages the logistics and export sales. Together, we finalize the sonic attributes of our products. Q: Are the Ayazi DAC and 3R USB Renaissance built in Greece or made offshore? A: Our products in terms of boards and electronics are designed 100% by us and the final product is assembled here in Greece. The circuit boards are precision engineered by robotics in specialized facilities. The finished boards are tested in our lab, then assembled into the chassis in our facilities. We are still an operation of enthusiasts. A significant part of our product is hand-made and tested in true high-end systems including our own and other local well-tuned systems. That way we are sure of our sound and keep the costs down. Q: I see that some dealers carry your product even near to me in Canada. Is it correct to state that you're operating a hybrid distribution model of Internet direct and select dealers? A: That is correct. At this time we hope to expand our distribution network retaining the same model. We find that when it comes to digital, our dealer is instrumental in guiding users to connect correctly and get best results. Problems with driver incompatibilities or unstable USB connections are very simple to solve when one knows how to do it (which many don't). Q: What prompted you to enter the market? Did you find the sound of existing designs deficient or was the cost for good sound out of reach? A: You nailed it: "out of reach". There are great designs and products and, anyway, it is not for us to criticize competing designs. Their people have worked hard on them. We know how it is! But the designs we mostly like and sonically approve of are priced stratospherically. We don't like overpricing which especially in digital and computer audio is getting ridiculous. We know this sector. Also, how many people think of investing 10K or more in a DAC when this sector continuously changes with new microchips? Fortunately, we have a good working relationship with a very gifted designer who is patient enough to tolerate our audiophile banter ("let's double the power-supply caps' voltage and capacity" etc). So we get high-quality sound that most people love, at a price that is actually affordable. We test and use the most audiophile parts with no compromises in cost where they bring the desired result. For example, in most DACs up to €3'000 (or even more), most manufacturers use clocks that cost less than €3. Ours costs 10 times more and the result is audible. Our capacitors are well thought off and sought after. We made our cost compromises with minimal features and plain aesthetics. It is after all just a €990 DAC. You cannot expect a luxury design although we now also offer an upgraded version at a slightly higher price to add some enhancements that make sense [see above]. For those seeking something even more upscale, there will be our more expensive flagship DAC yet to be named as it is still under final internal testing. It features a very sophisticated enclosure by a Red Dot awarded industrial designer following our guidelines. From now on, a whole new range of products will come under this signature design concept.